These are interesting times indeed for the church. Membership, budgets, and staff in many mainline congregations are shrinking. Attendance patterns are changing such that “regular” participation is now 1-2 times per month instead of 3-4. The Sunday morning and Wednesday evening time blocks, once considered off-limits by school, sports, and other community activity schedulers, are no longer so. Many people define themselves as spiritual but are uninterested in the institutional church. For these reasons some congregations are fearful about survival. This anxiety often manifests in a scarcity mentality, a focus on what we no longer have (or never had). In turn this mindset generates a wide range of potential “solutions,” which are rooted either in personal preference or observations about has worked for the megachurch down the road. This is a recipe for scatteredness - as everyone’s preferences will likely be different - and discouragement, since what works for one church rarely lands the same way in another. Any other assets you can think of - be creative! Step back and look at all the gifts. Ask what God might be telling you or inviting you to do through them. Combine your assets together in new ways to birth initiatives. These are the efforts that will bear the most fruit, because they are rooted in who your congregation is and what it has. This activity is very helpful during a pastoral transition. Congregations can have a hard time imagining what the future will look like now that the former leader is gone. Mapping assets can remind them that they are the church and that God is still at work through and around them. This exercise can also help a congregation understand what kind of pastoral leadership is needed to help them leverage their strengths and share a more accurate narrative and expectations with pastoral candidates. 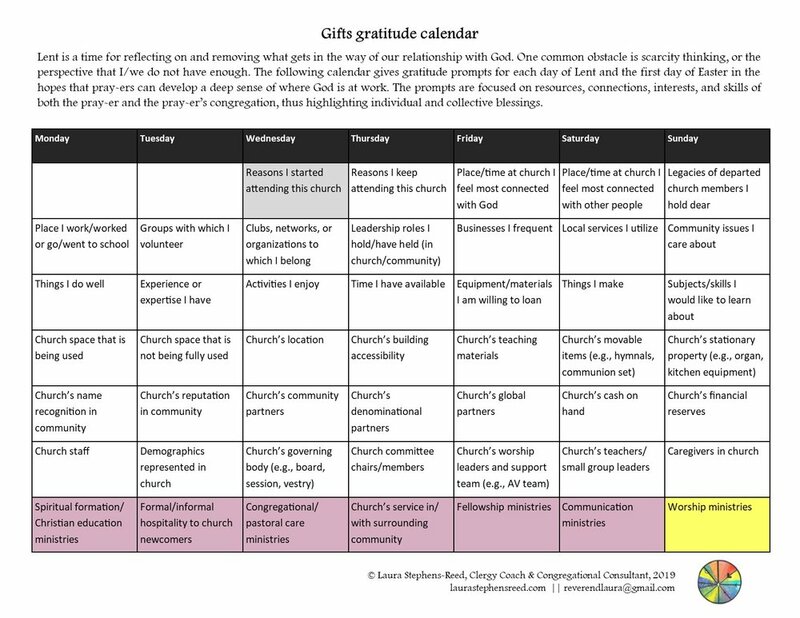 Go forth, then, to take stock of what is good in your church and to plan out of grateful awareness. Photo by G. Crescoli on Unsplash.